Much as the design of Denmark is popularly understood in a lazy, superficial, cliched manner, much as the design of Italy is popularly understood in a lazy, superficial, cliched manner, so East German design; albeit a lazy, superficial, cliched manner which has spawned its own term, one of the most odious ever portmanteaud, Ostalgie, a nostalgia for all things East Germany, or as Andreas Ludwig the Dokumentationszentrum’s founding director, once phrased it, a phenomenon of “westlichem Voyeurismus oder östlicher Selbstbespiegelung”2, western voyeurism or eastern narcissism; the latter can be experienced on a daily basis throughout East Germany, the former in the glee of tourists in Berlin revelling in and with the objects and imagery of a repressive totalitarian dictatorship. How did Jarvis Cocker once phrase it………? Yet as we all know, objects exist in context of, are intimately linked with, social, cultural, political, technological, economic realities and evolutions, and must be understood in the context which they arose. Not just for the sake of better understanding the object, but of better understanding history. 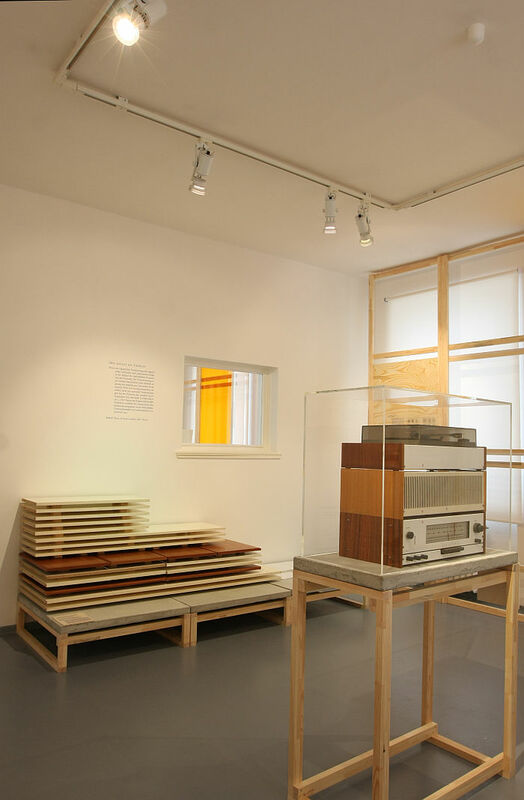 Established in 1993 as location for the collection, documentation and study of “objects of every day material culture” from East Germany, the Dokumentationszentrum Alltagskultur der DDR is about just that, of giving East German objects a substantiated place in an East German daily reality. Whereby the choice of Eisenhüttenstadt as location for the Dokumentationszentrum is anything but random; much more can be found in the (hi)story of Eisenhüttenstadt within East German daily reality. Developed from 1950 onwards as a planned city to provide homes for the workers of the newly established Eisenhüttenkombinat Ost steel mill, the city was originally named Stalinstadt and the first houses, those that form the core of contemporary downtown Eisenhüttenstadt, reflect the dominant Stalinist neoclassicism of early 1950s East Germany, an architectural fetish that was largely about establishing a sense of East German identity, an identity distinct from that of imperialistic West Germany with its concrete boxes and high-rises, and one that fundamentally rejected the positions and ideals of the inter-war modernists. For all Bauhaus. Then Stalin died, Stalinism gave way to the (relatively) more liberal policies of Nikita Khrushchev, and the DDR suddenly realised that it needed faster, cheaper, more efficient construction systems, that it needed concrete boxes and high-rises, that it needed the positions and ideals of the inter-war modernists. The era of the Plattenbau arrived; East Germany, and for all industrial cities such as Eisenhüttenstadt with its need for an ever increasing labour force, becoming defined by high-rise estates, high-rise estates based around a family of pre-fabricated typologies developed by the Bauakademie Berlin, and which in addition to allowing the DDR to build the homes they required at the speed and cost required, also promised DDR citizens new levels of comfort and functionality. And which in the immediate post-DDR years increasingly stood empty and fell into disrepair, before being either demolished or modernised and reinvigorated as the economy stabilised. Whereby the first thing to note is that Shaping everyday life! is not a Bauhaus exhibition. Bauhaus closed in 1933, the DDR was established in 1949. Shaping everyday life! is not a Bauhaus exhibition. Is however an exhibition which follows the work of Bauhäusler, and for all the development of ideas begun in Bauhaus and environs in the turbulent political landscape that was the DDR. And thus in many regards can be considered an extension of Bauhaus Imaginista at the Haus der Kulturen der Welt Berlin; there you can follow the post-War development of individual Bauhäusler and wider modernist ideas in India, Japan, South America, et al. In Eisenhüttenstadt you can follow the post-War development of individual Bauhäusler and wider modernist ideas in the original theatre. To this end the curators have developed Shaping everyday life! on three levels: a design level, a cultural policy level and a biographical level. The last of which we haven’t seen. The practicalities of compiling such a blog, and to allow the briefest chink of light behind our velvet curtain, means that we normally view exhibitions before they open, and in the case of Shaping everyday life! the biography section was still being assembled when we visited. However, from what we’ve seen, and from what we’ve been told, will, should by now, feature a presentation of not only the biographies of some 50 DDR era practitioners but for all allow for a visualisation of the numerous networks and connections that existed between the 50; networks and connections which ran over institutions such as the Bauakademie Berlin, Burg Giebichenstein Halle, or Bauhaus, and networks and connections which often began before the war and then continued afterwards in first the Soviet Occupation Zone, SBZ, and subsequently the DDR. The cultural policy level is, essentially, that which we referred to above, and being as it is inextricably linked to the design level, the two weave effortlessly through each other in the course of exhibition’s narrative. As previously discussed in these pages, before Stalin denounced Formalism as the enemy, the DDR leadership had a relatively relaxed and open attitude towards Bauhaus/International Modernism, Walter Gropius himself even making a trip to Berlin in 1947 to promote his and Konrad Wachsmann’s new modular construction system; that however all changed in 1950 and the start of the so-called Formalism Debate, a “debate” which, effectively, declared that the ideals and positions of institutions such as Bauhaus were personae non gratae in the DDR, a debate we let off quite a bit of steam about in an earlier text, and a debate which opens Shaping everyday life! And a debate reflected in the pre-history of Eisenhüttenstadt, in the fact that, as the exhibition explains, initially there were two plans developed for Eisenhüttenstadt, one by Kurt W. Leucht, which was not only realised but which, in many regards, subsequently formed the basis of the so-called “16 Principles of Urban Planning” which defined the neoclassicism of East German architecture and urban planning in the first half of the 1950s, and a second by the Bauhäusler Franz Ehrlich. Which is/was notably more functionalist, International Modernist. Which at the time of its commissioning was acceptable; by the time the first sod was dug for Stalinstadt wasn’t. 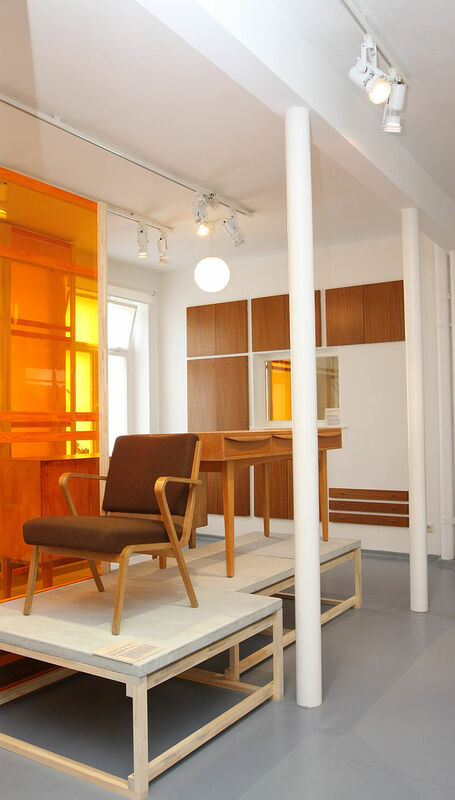 That functionalist, International Modernist ideals were initially embraced and encouraged is also demonstrated in the furniture which greets the visitor to the exhibition, not least through the 1949 Werkstattstuhl by Mart Stam for the Kunsthochschule Berlin Weissensee and produced by Metallbau GmbH Halberstadt; a truly joyous, joyous piece of work that grabs and holds your attention from the first moment, initially because it seems to be so very wrong, but then because you realise that it is very, very right. At least formally, we’ve not tried it. But for all is a work which reminds us all that Mart Stam taught at Weissensee, before being denounced as a “Formalist” and forced to leave the DDR. 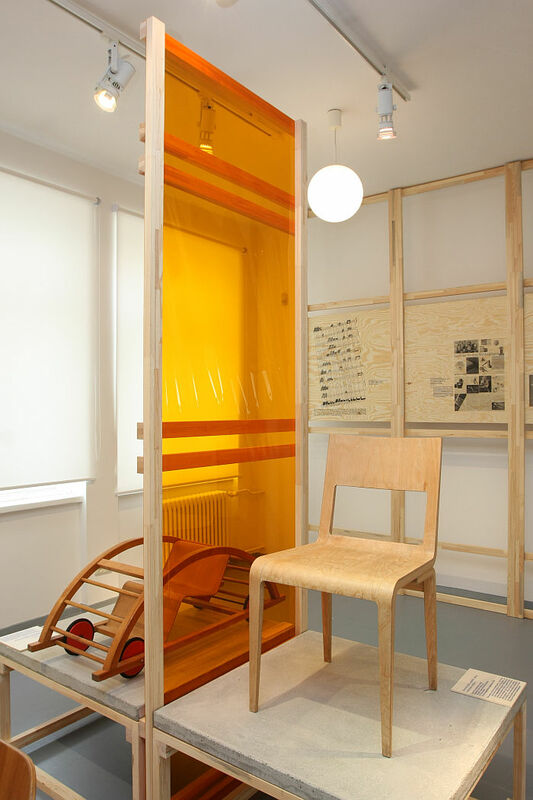 That the likes of Stam were, arguably, heading in the right direction tending to be underscored by the so-called 3101 chair by VEB Stima Stendal from 1959/60, a steel tube chair which, according to the curators, was one of the most produced chairs in the DDR, a chair which presents the most gratifyingly, stupidly, simple construction, a construction, and therefore chair, which on closer inspection owes an awful lot to the cantilever chairs of the 1920s, and a chair which thus reminds us of Stendal’s important role in the development of steel tube furniture in the inter-War years. Aside from such furniture objects a particular highlight for us is and was Gustav Hassenpflug’s Baukastenmöbel system, a popular concept in the inter-War years as architects sought to standardise not only daily life but the production of the goods of daily life, and an idea that, at least in 1949, Hassenpflug, as with Stam, seemed to believe was appropriate for the DDR. And which in many regards it was, if it also had to wait until the Formalism Debate had subsided to demonstrate the fact. Following the death of Stalin not only did a new wind blow through East Germany, but a new understanding of economic realities, a new understanding which not only saw standardised, pre-fabricated construction methods championed but saw the same increasingly applied to furniture, including, for example, the Series 602 by Franz Ehrlich for VEB Deutsche Werkstätten Hellerau, an institution which, and as discussed in context of Against Invisibility at the Kunstgewerbemuseum Dresden, played just as important a role in the pre-War (hi)story of furniture design and production in eastern Germany as it did post-War. Among the more notable DDR era developments from Hellerau being the so-called Montagmöbelprogramm Deutsche Werkstätten, MDW, a modular, flat-pack furniture system developed by Rudolf Horn, a system which viewed with today’s eyes is thoroughly unspectacular, yet which at its launch broke radically with established DDR furniture industry practices, a system which became standard in the high-rises of East Germany, a system which outlived the DDR, and a system which on its launch at the 1967 Leipzig Messe was greeted by the DDR’s First Secretary, and trained carpenter, Walter Ulbricht with the words, “das sind ja nur Bretter”, that’s just planks. The open, adaptable construction principle followed by MDW is continued in Shaping everyday life! through works such as an RFT stereo system or the Simson Mokick S59 by Karl Clauss Dietel and Lutz Rudolph, a motorcycle that not only presents a reduced, uncluttered, accessible design, but one that on account of its uncluttered accessibility enables and encourages repairs, upgrading and/or modernising, allows the user a greater degree of flexibility, and thus allowing for a more durable object with a longer life cycle. 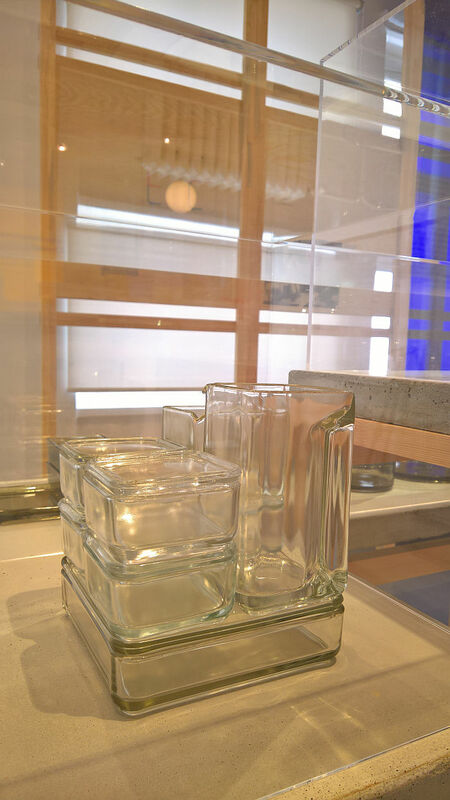 Objects in the DDR, unlike political or economic policies, being transparent, democratic and conceived to last. Rudolf Horn is also represented in Shaping everyday life! 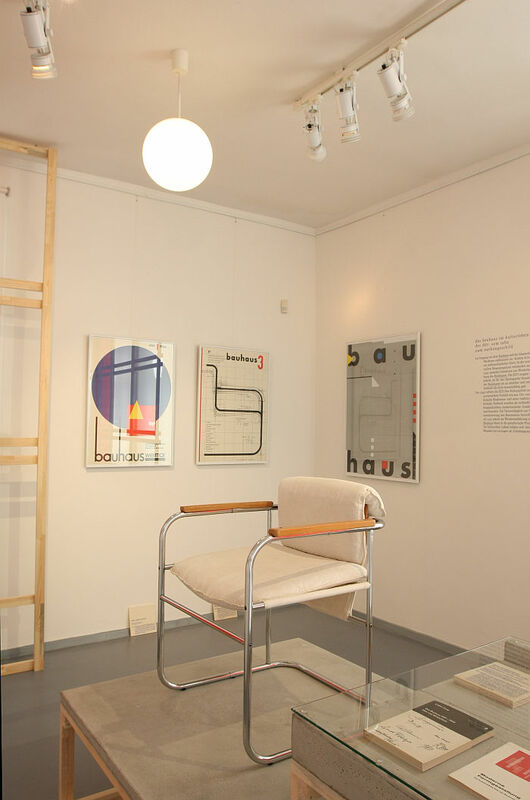 in the exploration of DDR graphic art, albeit not by graphic art but by his Conferstar Club Chair, a work he famously created after finding Mies van der Rohe’s Barcelona Chair so uncomfortable he felt duty bound to improve it, and thus less an act of Bauhaus influencing the DDR as the DDR updating Bauhaus. One of several in the course of Shaping everyday life! The principle focus of the graphic art presentation is DDR era book and poster design, starting in late 1940s with Bauhäusler such as Walter Funkat or Hajo Rose and moving on over the likes of Helmut Brade, Artur Liebig or Frank Neubauer, and thus a younger generation of eastern German creatives who developed their works not only with the understandings of the Bauhäusler but for all against the realities of the period. 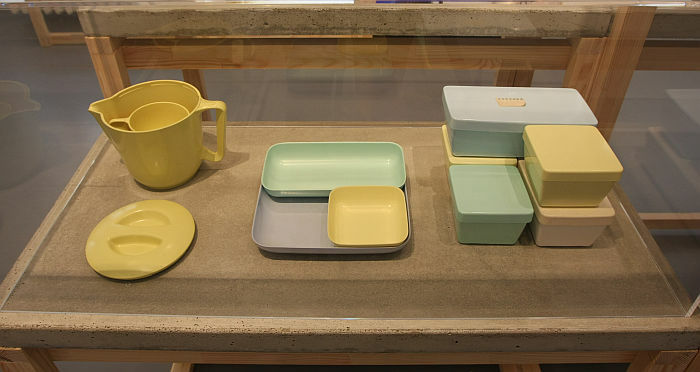 The final section presents a selection of crockery, vases, kitchenware, et al which stand representative of glass and plastic design in the DDR, including a collection of objects from 1959 by Albert Krause for VEB Plasta Preßwerk Auma, a collection created from Meladur, a new synthetic material based on melamine resin, and a collection which in their stackability can be considered in the tradition of both Christian Dell’s 1930s Resopal works for Römmler AG, Spremberg, and Wilhelm Wagenfeld’s 1930s pressed glass work for Vereinigte Lausitzer Glaswerke, Weißwasser; works which were, as with Krause’s, about applying the properties of a new material to new daily realities. The contentions of the Formalism Debate being far enough away to allow one to pretend that they had never existed, and to increasingly allow the ideals and positions of Bauhaus, and wider International Modernism, to permeate into East German design. As Shaping everyday life! very neatly illustrates. And Shaping everyday life! 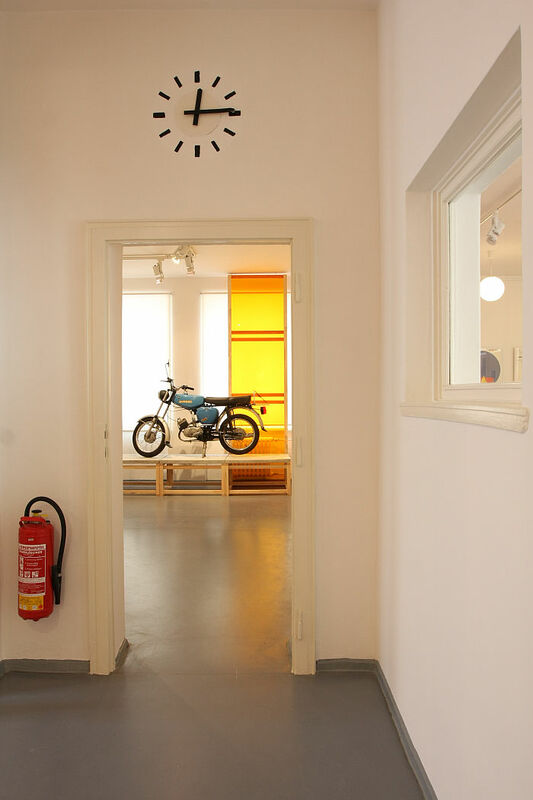 is an East German design exhibition. Shaping everyday life! is not a Bauhaus exhibition. 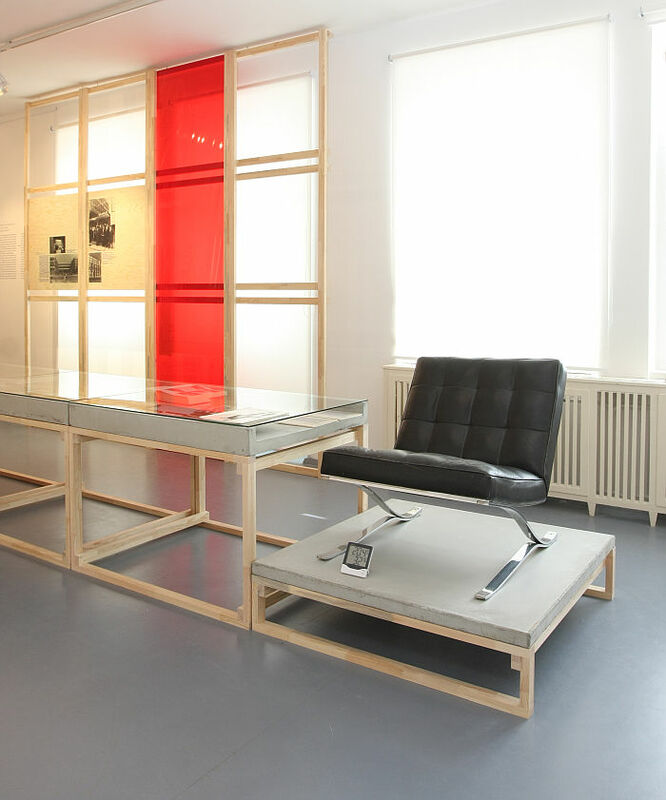 It’s an East German design exhibition, in context of Bauhaus. Something underscored for us by the absence of post-War objects by Marianne Brandt. As noted previously, most recently from Four “Bauhausmädels” at the Angermuseum Erfurt, a career in the DDR regrettably remained elusive for one of the region’s more naturally talented designers. The unnecessary loss of skilled design talent on account of the DDR’s aggressive dogma being further underscored by the fact that some of those featured in the DDR’s earlier years quickly left, including the likes of the Bauhäusler Wilhelm Wagenfeld, Herbert Hirche or Gustav Hassenpflug, and of course the Formalist Mart Stam. A bijou exhibition, or at least in terms of objects and floor space, the former by necessity of the later, in terms of scope and discourse Shaping everyday life! is much more expansive, is a much more involved and deeper presentation than first glances might lead you to assume. 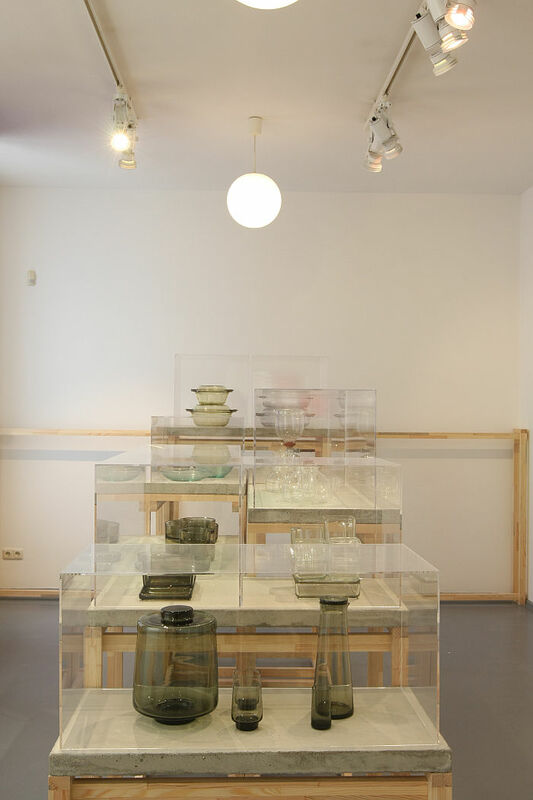 A state of affairs aided, abetted and encouraged by an exhibition design devised by Visual Communication students at the Kunsthochschule Berlin Weissensee, one which although very much of pedestals and glass vitrines allows the visitor to get up close with the exhibits, while the bilingual German/English texts hold your hand and guides you through the narrative. An intelligently woven narrative which allows one to better understand the formal developments of the DDR in context of the wider developments. In our post on the UK’s wartime Utility Furniture Scheme we noted that the formal and material reduction, the simplification of construction and visual and physical lightness of the furniture were a consequence of the privations of war rather than any ideological position, if a state of affairs the proponents of a more reduced, functionalist-formalist understanding of design saw as advancing their position. Shaping everyday life! 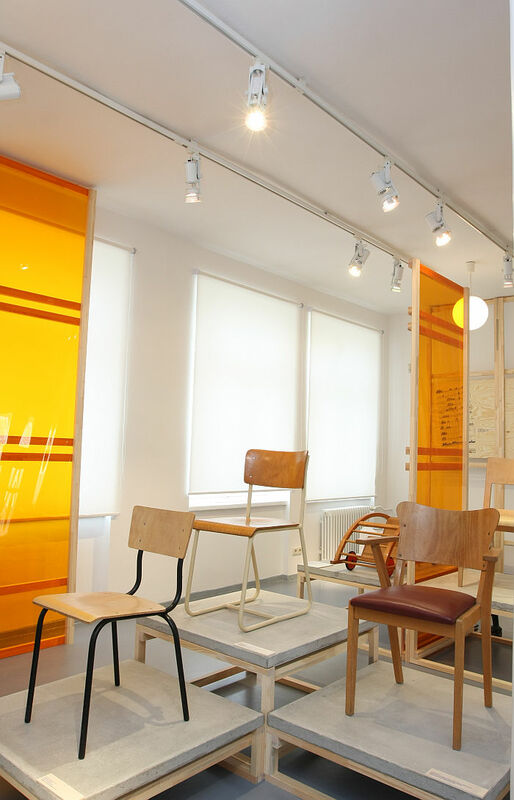 indicate one can understand the development of design in the DDR in a similar vein. Not that we’d compare the privations of Wartime Britain with the DDR; however, insofar as formal and functional developments in the DDR were more often than not initiated, more or less, as a component of economic and political policies, rather than arising as a response to the consequences of such, one can argue that the developments of design in DDR were largely dictated, if developed freely by designers who were keen to move in such directions and thus gladly accepted the opportunities as and when they arose. Or put another way. Whereas the works before 1950 represent a natural progression of the ideals of Bauhaus and International Modernism, from 1950 onwards developments were much more of the state controlled type. First controlled neoclassicist, before the ideals of the designers and architects trained in or inspired by the ideals of Bauhaus and International Modernism increasingly met the demands of the state, without not being completely free, not fully controlled, but limited. Or where is the East German Post-Modern? 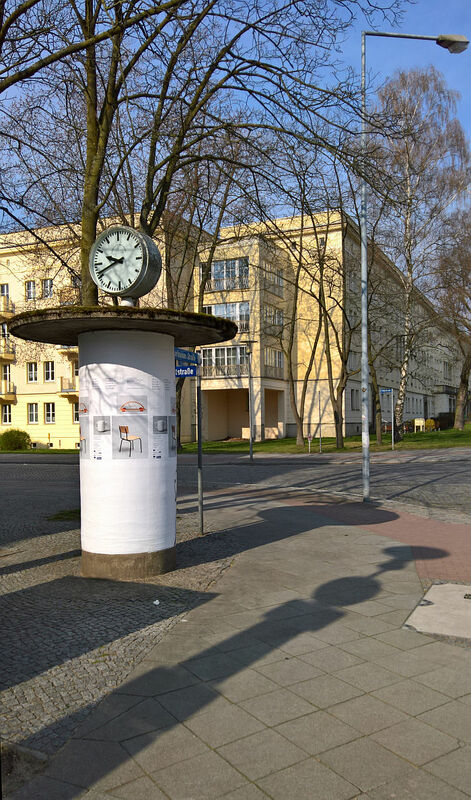 West Berlin was one of the main centres of mid-1980s Neues Deutches Design. And East Berlin? Not that one need to wait until the 1980s to pose such questions, for example, while in the late 1950s objects were being created at Burg Giebichenstein from Meladur in a Wagenfeld spirit, Wagenfeld in the late 1950s had moved on from the rigid geometric forms of Bauhaus and was developing much more naturalistic objects. Similarly an Arne Jacobsen, a designer and architect who was as influenced by Bauhaus as much as by Danish vernacular, and who in the course of the 1960s moved on from Modernist Ants to much more organic Swans and Eggs. The likes of a Wagenfeld or a Jacobsen had moved on. Their understandings of form, function, design had developed, had become dissociated from Bauhaus, and was allowed to do so. The understandings of DDR designers unquestionably also evolved, the political situation didn’t. Or arguably not until the establishment of the Zentrum für Gestaltung in 1986, but by then the DDR was approaching its end. And this is, one imagines, how most East Germans will view Shaping everyday life!, “Oh that cup, my grandmother had that one, damals.” Damals. Back in those days. Understanding contemporary eastern Germany involves understanding the Culture of Damals, both the culture of “damals“, as in developing a translation of “damals” that goes far beyond that which any dictionary can achieve and which allows you to understand “damals” as a central competent of the East German psyche, and not just of those who were alive damals, “damals” is inheritable. But also the “culture of damals”: the political reality, the economic reality, the social reality and how that manifested itself, in literature, in music, in clothing, in art, in architecture, in daily routines, in human interactions and in the furniture, crockery, motorbikes and posters of the DDR. For, and as discussed in context of the Kulturhistorisches Museum Rostock’s exhibition Von Ata bis Zentralkomitee, much as the study of pots, jewellery, utensils from antiquity is an attempt to understand a lost culture from the artefacts it left behind, so to can the furniture, crockery, motorbikes and posters from the DDR be understood as the cultural artefacts of a no longer extant culture; the fact the DDR is in living memory not making it any more extinct than the Roman Empire. Nor making its artefacts any less informative, less interesting, less important. In Rostock those artefacts were used to discuss state control, in Eisenhüttenstadt through the comparison with Bauhaus, through viewing DDR artefacts in an alternative framework, one with a close connection, spatial, temporal, biographic, to the DDR, allows for a differentiated perspective on the artefacts of the DDR, allows for a new reading of the functionality and formal aesthetics of the objects of the DDR, allows for the development of a more durable and realistic (hi)story of design in the DDR, and for all allows for the approach to an understanding of design in the DDR which transcends the lazy, the superficial, the cliched. And while an exhibition such as Shaping everyday life! may not on its own serve to end the voyeurism and narcissism of Ostalgie, it does allow us to move closer to that glorious day, and ultimately a more probable understanding of eastern Germany, today, and damals. Shaping everyday life! 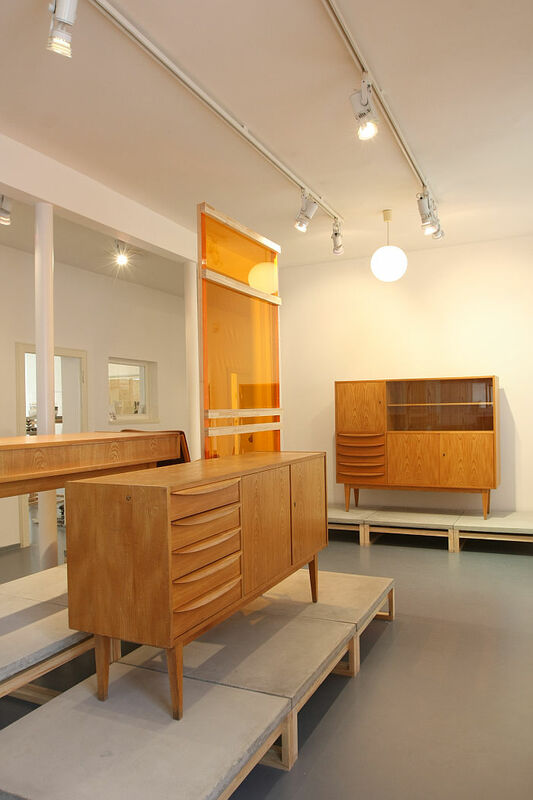 Bauhaus modernism in the GDR runs at the Dokumentationszentrum Alltagskultur der DDR, Erich-Weinert-Allee 3, 15890 Eisenhüttenstadt until Sunday January 5th.